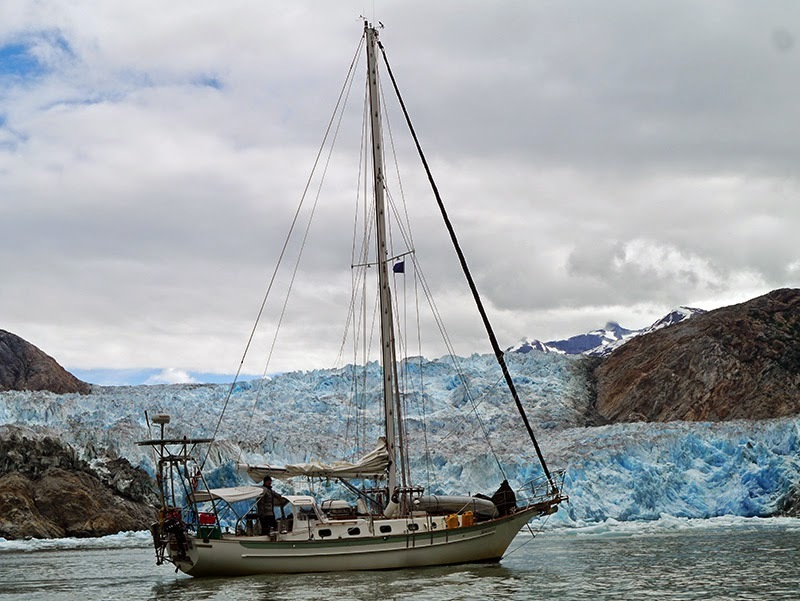 Our last anchorage before Juneau was in Funter Bay, at the junction of the Saginaw Channel and Icy Strait. We got to sail across the Saginaw Channel on a reach, the longest distance we’d sailed since our trip down to Redbluff Bay. 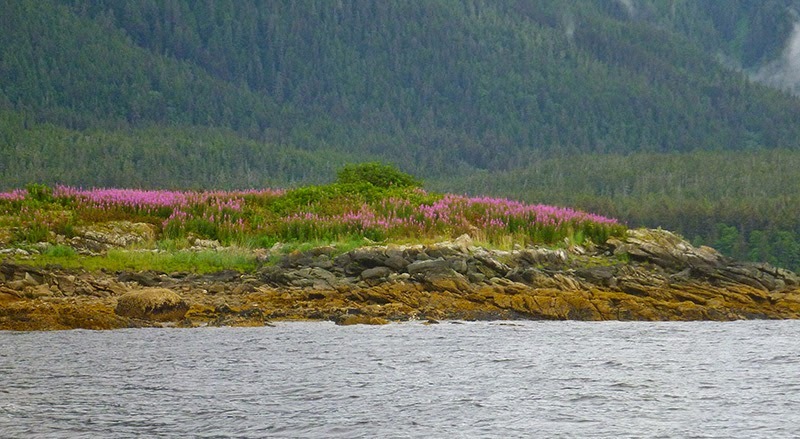 Funter Bay was non-remarkable as an anchorage---and it probably wouldn’t be a good one in a blow---but as we passed Bare Island in the entrance to the bay, we saw that the fireweed was in bloom. The next morning, we rounded the Mansfield Peninsula, the northern tip of Admiralty Island, and entered Stephens Passage. We passed the Mendenhall Glacier en route to Juneau. 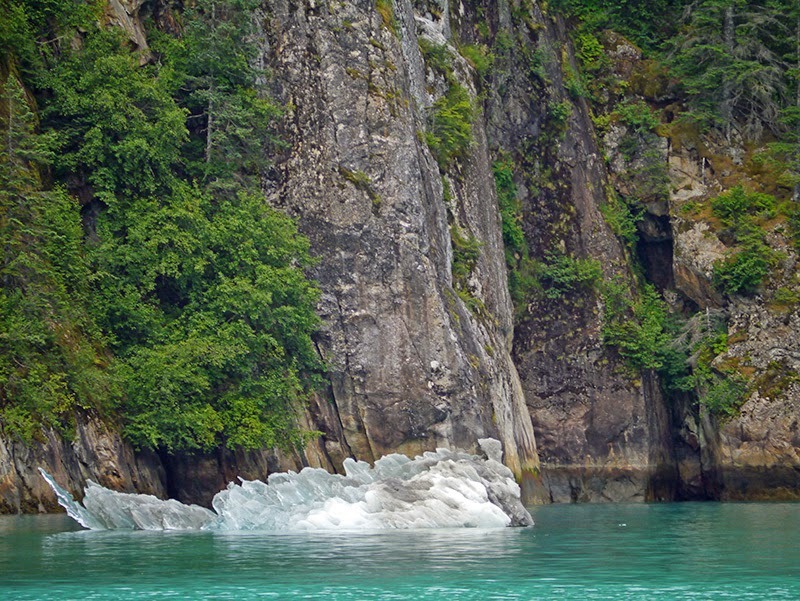 As we approached Gastineau Channel, the channel on which Juneau is located, we began to see the influence of the glaciers north and south of Juneau on the color of the water. We saw hues we hadn’t seen since the tropics, only opaque and milky instead of air-clear. 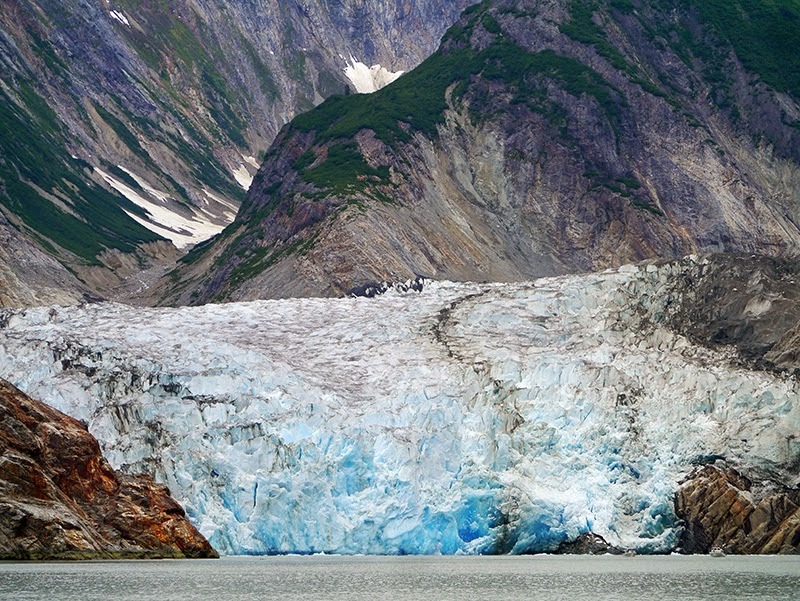 Juneau occupies a dramatic setting, at the base of steep mountains along the Gastineau Channel. 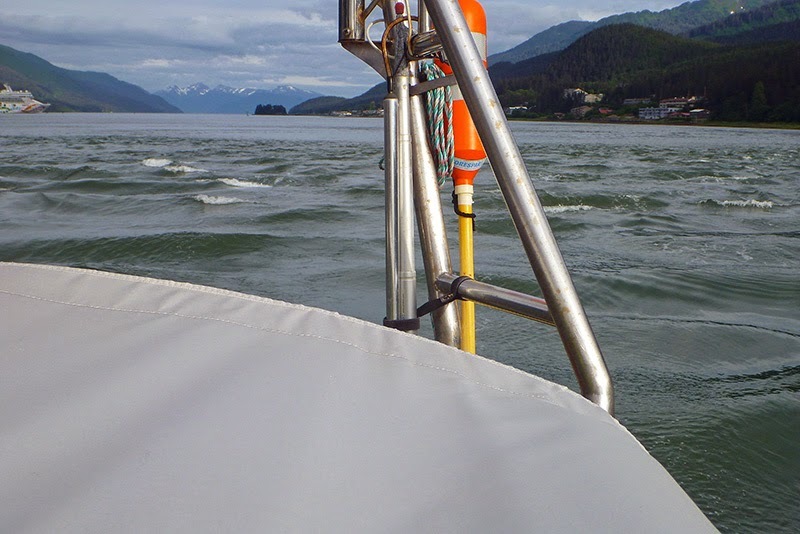 We had to anchor temporarily in a bay across from the town of Douglas before we could enter Harris Harbor. 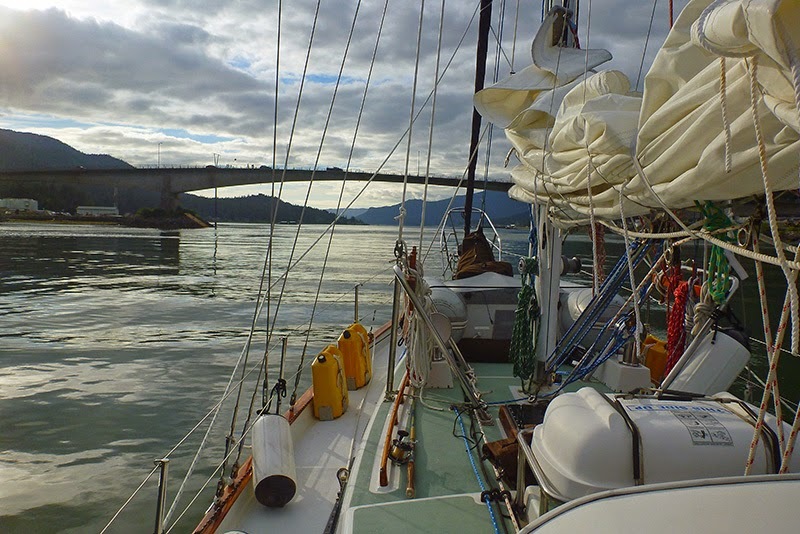 The bridge between Douglas and Juneau only has 51’ clearance at mean high water, and Silhouette’s mast is 50’ tall. We arrived during the full moon, the time of month with the highest and lowest tides. Patrick decided to wait for the high tide to ebb for a couple of hours before attempting to enter the harbor. 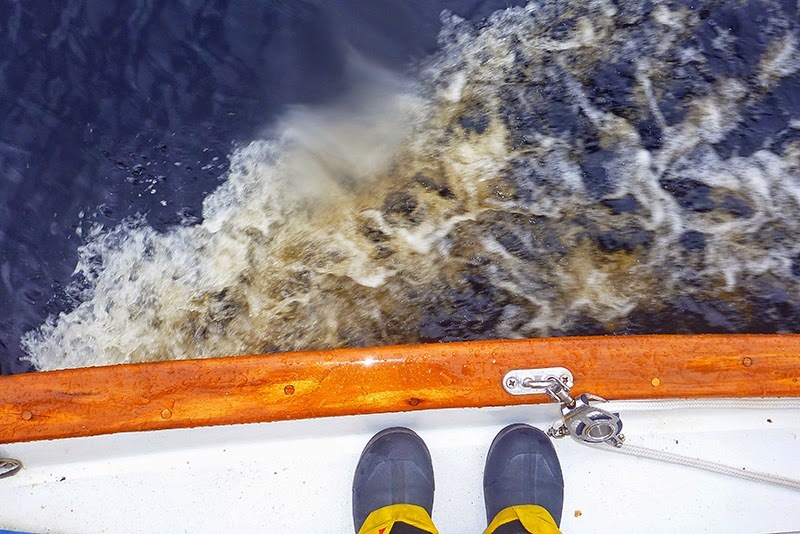 Although we had enough clearance when we entered, it was still a challenge keeping the boat lined up with the high point of the bridge, due to current in bridge’s vicinity, and then making an immediate turn to starboard after clearing the bridge into the entrance of Harris Harbor. We didn’t find Harris Harbor---or Juneau itself---particularly cruiser-friendly from a logistics standpoint. 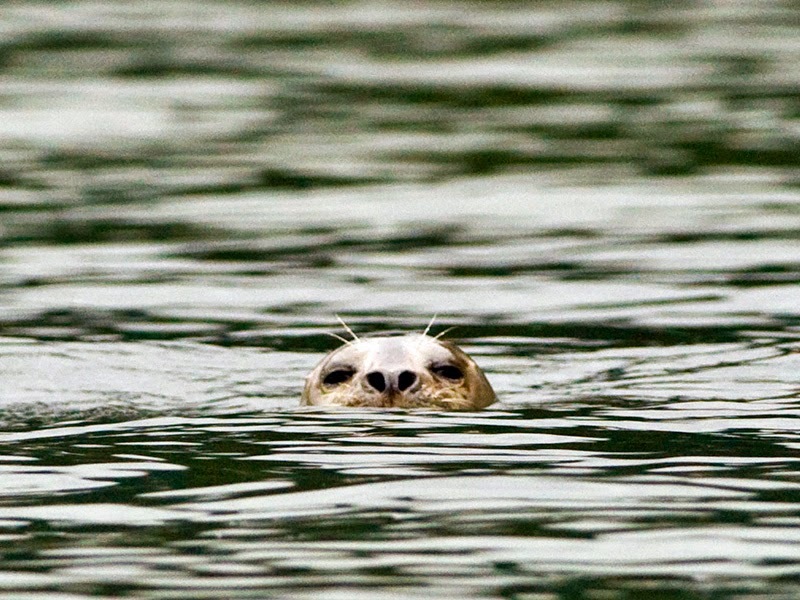 (The people we met in Juneau were very friendly and welcoming.) 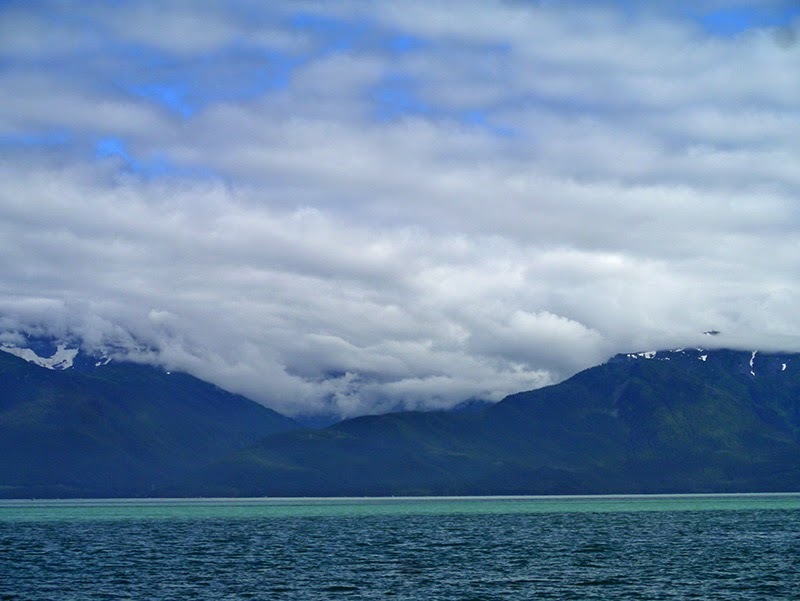 We probably wouldn’t make the long detour up the Gastineau Channel to resupply there again. 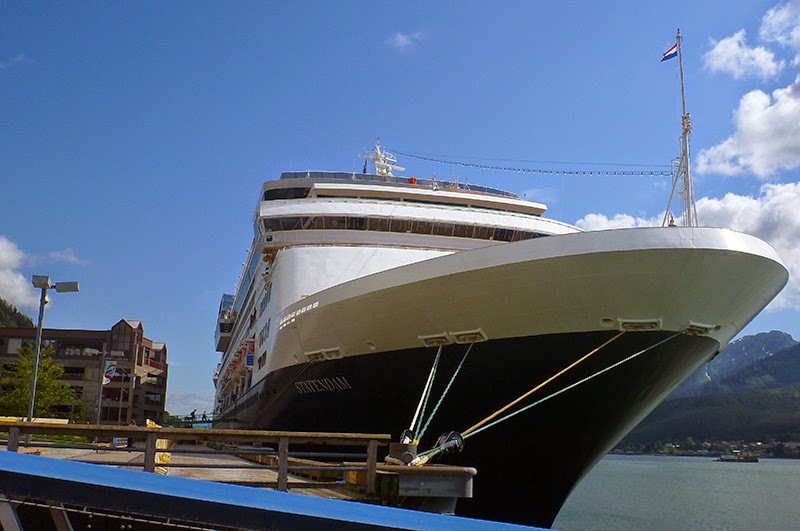 Downtown Juneau has become very much a cruise ship tourist destination: At any given time, there are three or four large cruise ships at anchor in the channel. 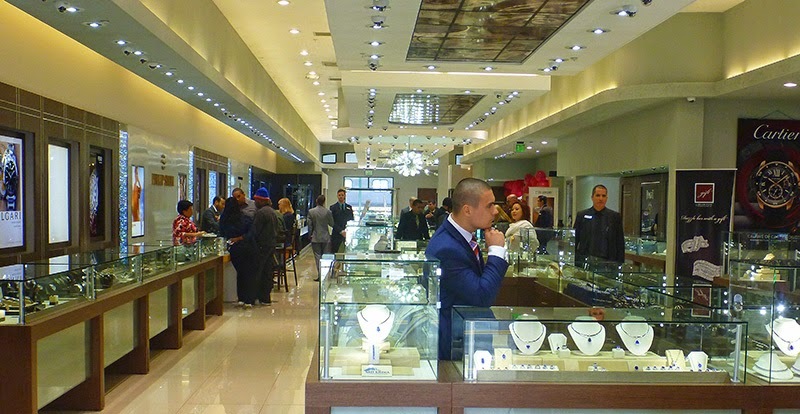 Some of the downtown shops specifically catering to the tourist trade probably rival those on 5th Avenue in New York! The Cartier store in downtown Juneau: Another kind of "ice"
Seaplanes bringing tourists to and from the glaciers were also constantly to-ing and fro-ing from the port of Juneau. Since Juneau is Alaska’s capital, it also has its share of government buildings, including the Governor’s Mansion. 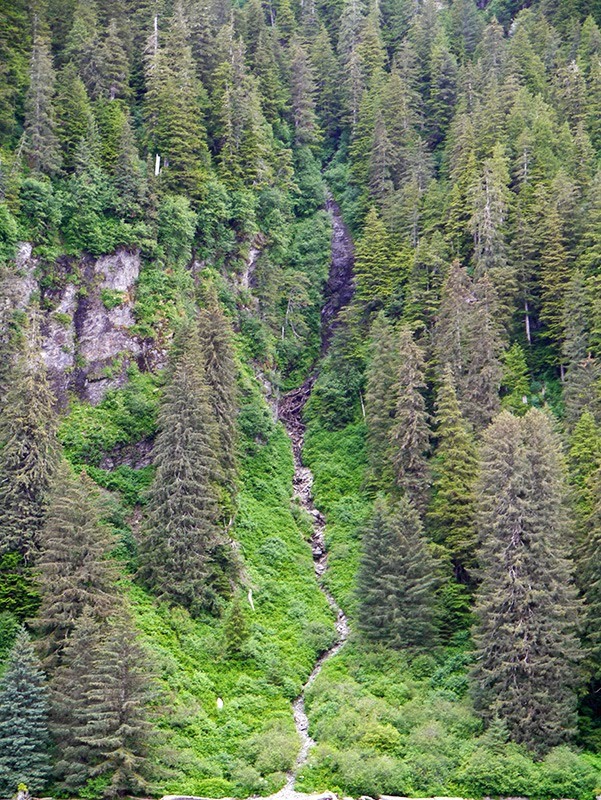 Juneau has a history as a gold mining town. 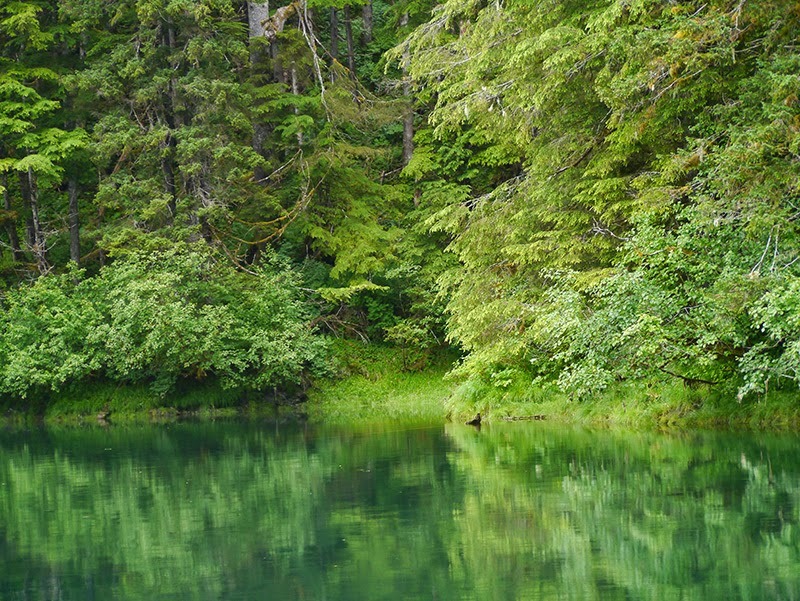 Led to the source by their Tlingit guide Kowee, Joe Juneau and Richard Harris struck gold in Gold Creek. While we didn’t visit the “Last Chance Gold Mine Museum,” some relics from the mining days---such as ore carts and a pulley-operated cage used to lower miners into the mine shaft and bring them up again---were stationed around the cruise ship terminal area. Unfortunately, the State Museum was closed for renovation during our stay. 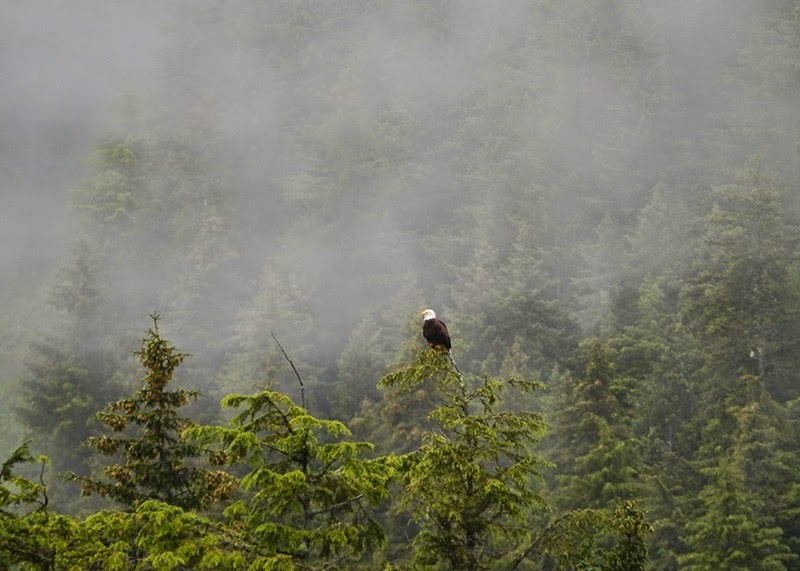 Towering over Juneau is Mt. Roberts. We didn’t take the steep, five-mile hike to the top (from which you can either take a tram or walk down), but that seemed like something worth doing. We did take a nice forest walk that passed along an old wooden flume, used not for logging, but for hydropower in Juneau’s past. 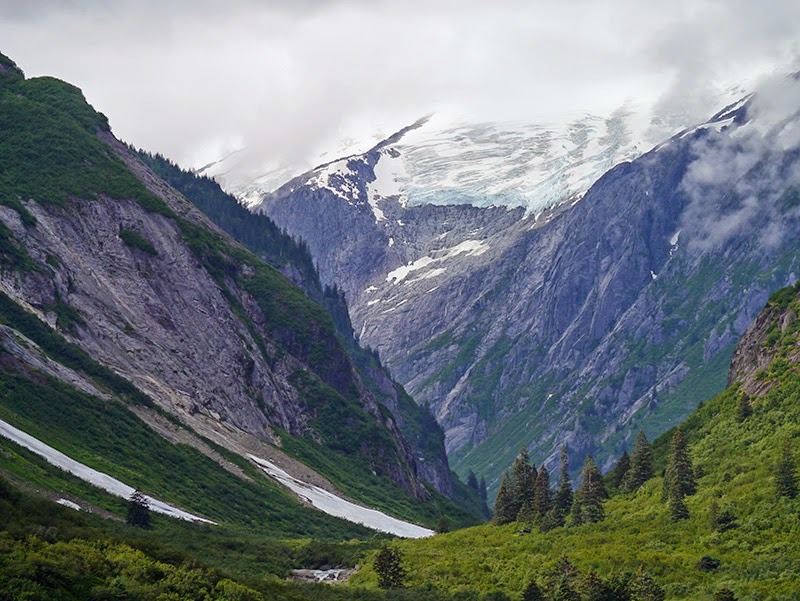 From Juneau, we continued south along Stephens Passage.We had such fair weather the day we left Juneau, we didn’t make an intended stop at Taku Inlet, but carried on down to Tracy Arm. 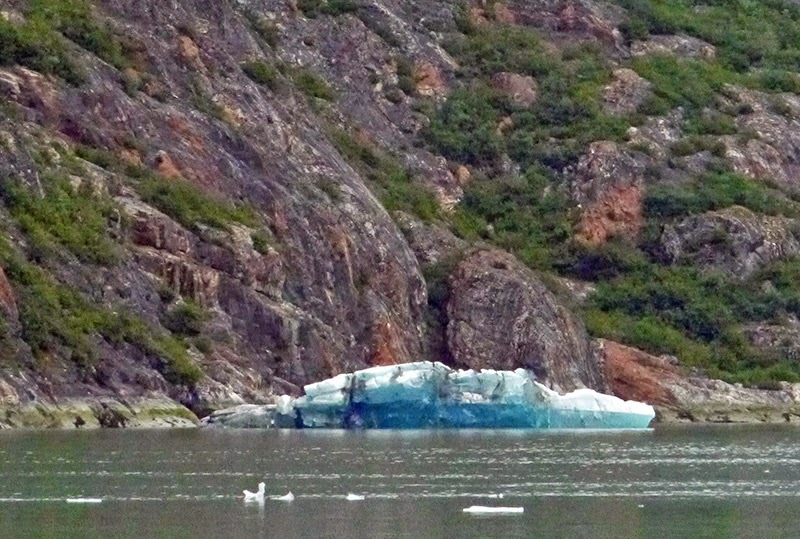 We passed our first icebergs in the inlet---and had a view of the Sumdum Glacier---on the way to the anchorage. 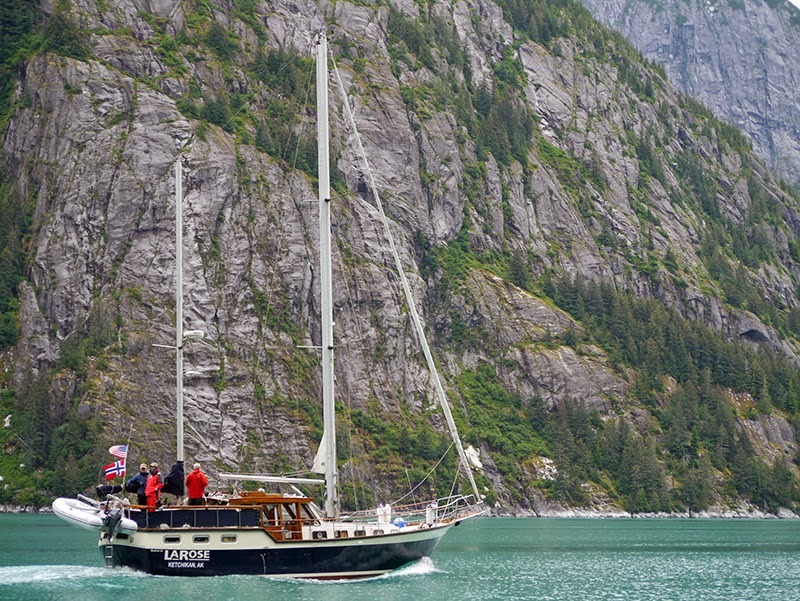 We anchored in Tracy Arm Cove along with about half a dozen other boats. 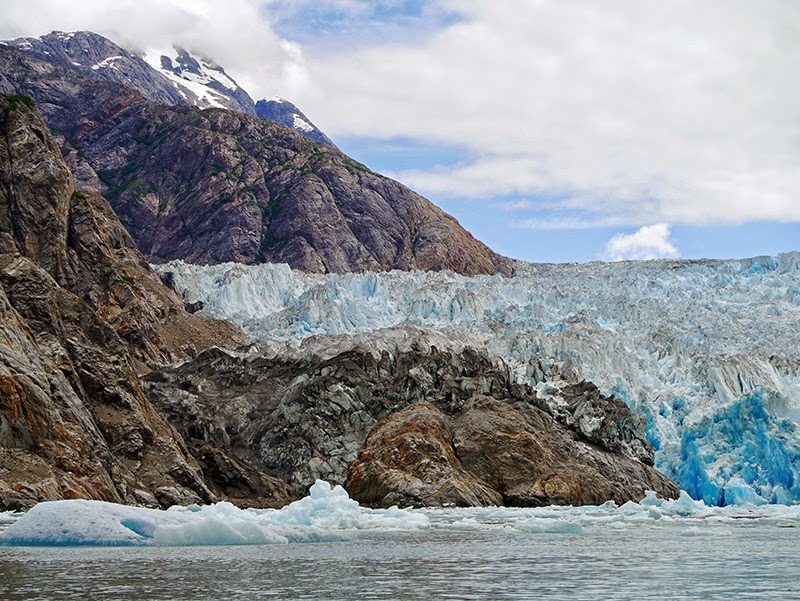 The next morning, we were underway at 7:00 a.m. to make the trip up Tracy Arm to visit the North and South Sawyer Glaciers, a trip that has proved to be one of the highlights of our Southeast Alaskan cruise thus far. The gray skies had returned, but at least it wasn’t raining. 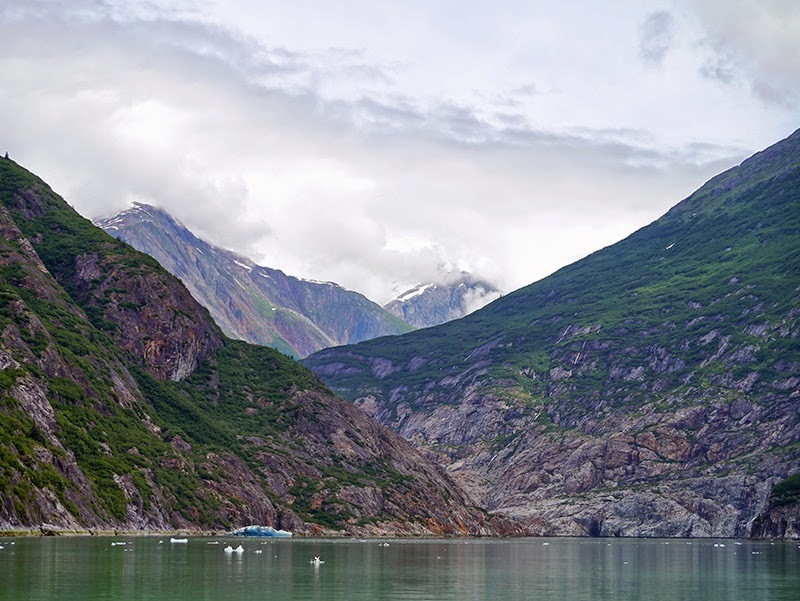 Tracy Arm shares an opening with Endicott Arm; that’s why it’s considered and arm; but Tracy Arm is really a steep-sided fjord. It’s towering granite faces remind one of the massive rock walls in Yosemite and Zion National Parks, only these granite walls have been carved out by glaciers. Some of the faces look absolutely tortured with scars, as if barbed-wire and not ice, had carved out their features. Other rock faces were worn smooth by the passing glaciers. In this amphitheater, ice was the artist. 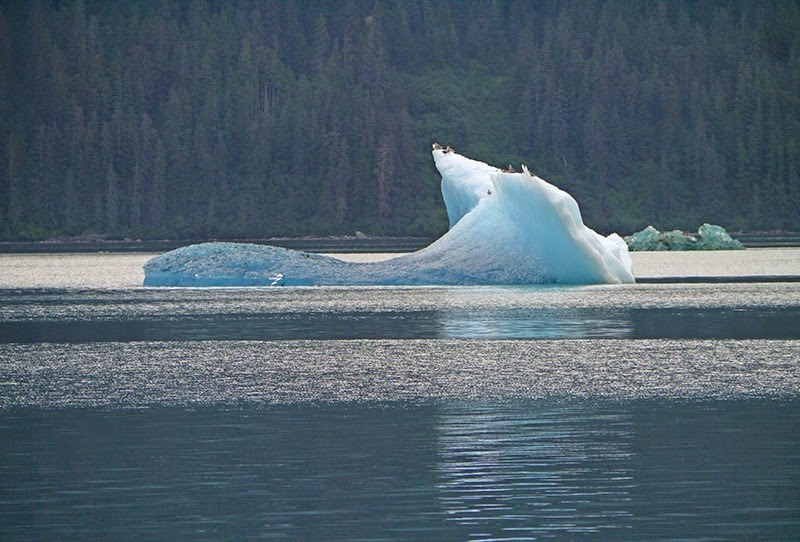 In powerful, masterful strokes, the ice carved out Tracy Arm, and then---ephemerally---just melted away. It’s difficult to comprehend the powerful force of the ice and its transitory nature at the same time, but looking at this landscape, it’s impossible not to think about it. 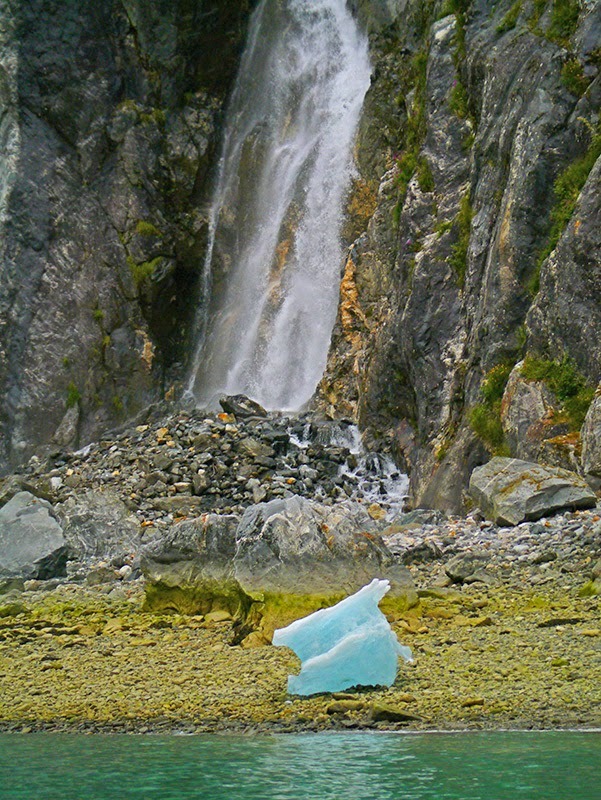 Just as we arrived at the approach to South Sawyer Glacier, the miraculous occurred. 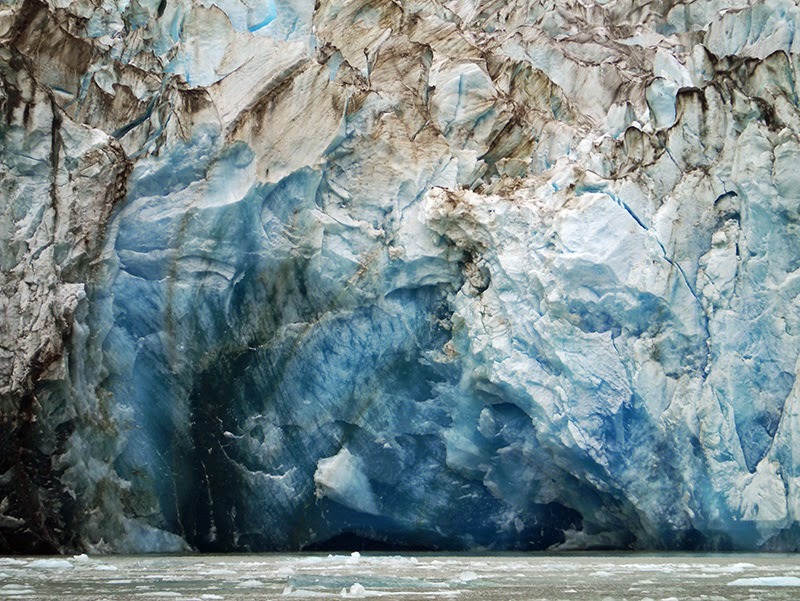 The sun broke through just enough to highlight the deep cobalt and turquoise colors in the glacier ice. 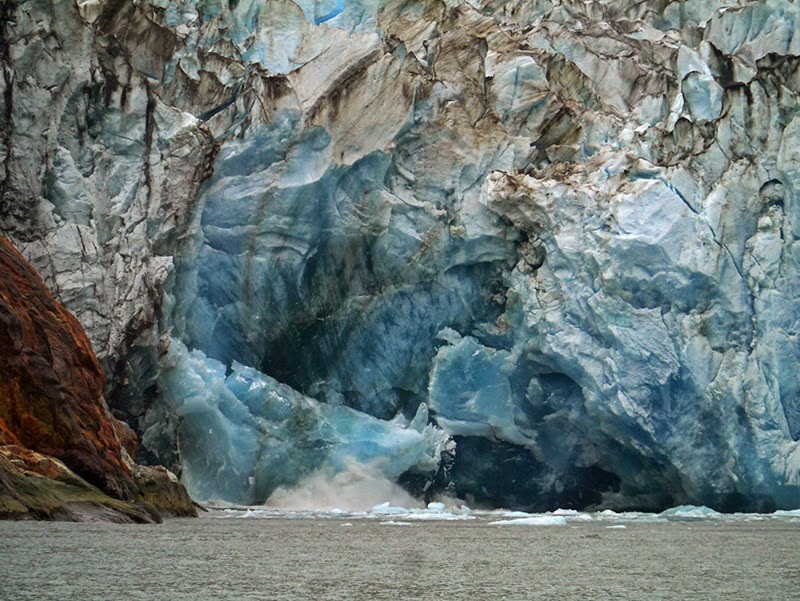 You hear the calving glacier before you see it. 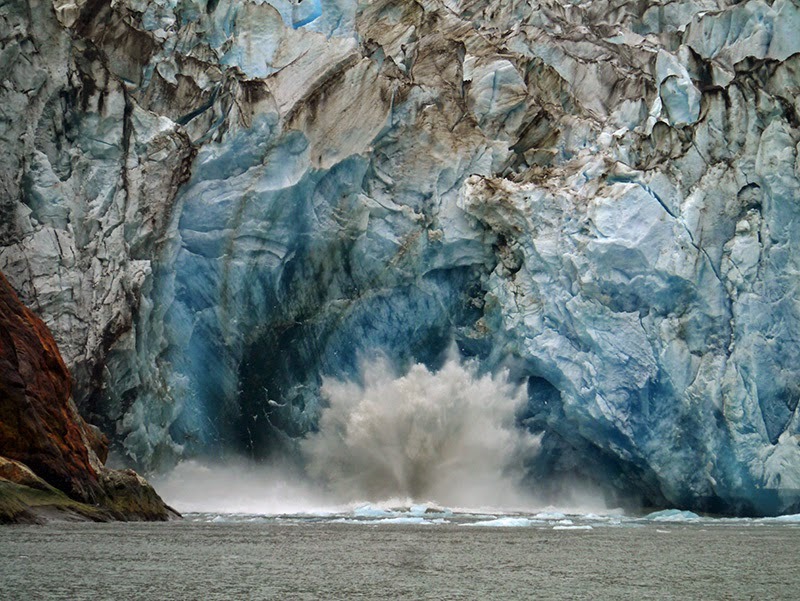 Cracks, creaks, and groans in the ice precede actual chunks of the glacier falling off, creating seawater explosions like miniature mushroom clouds. 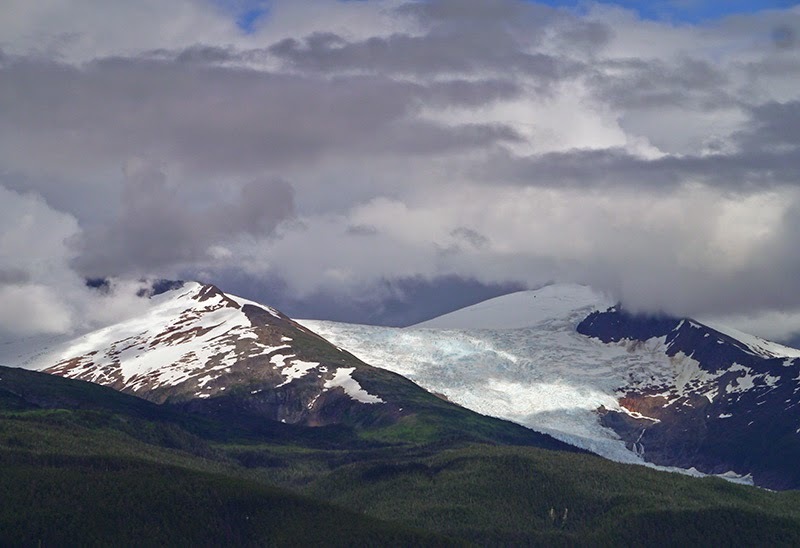 This process, it appears, has been linked to giving birth, since the name for it is “calving.” We saw calving at both the South and North Sawyer Glaciers. The icebergs we saw all the way up the 25-mile long Tracy Arm, as well as in the anchorage and well out into Stephens Passage, all originated at one of the two glaciers. 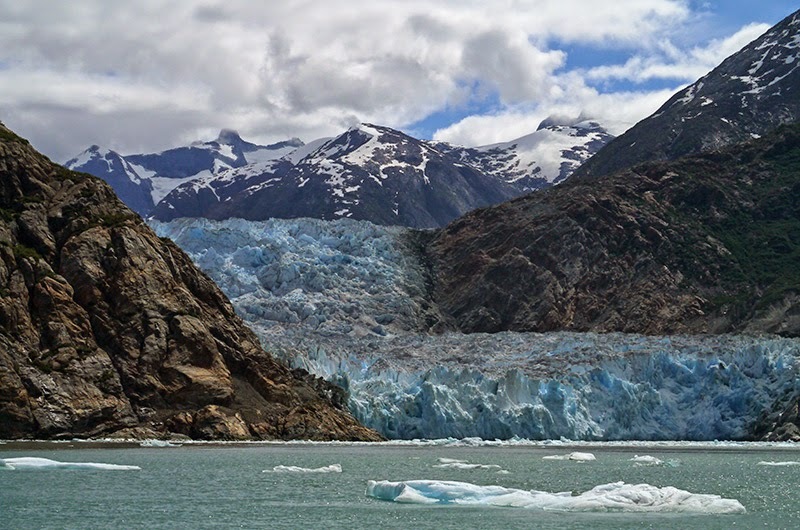 We also saw areas of bare rock at both glaciers which we believe indicate areas where the glaciers have receded (which is both a natural process and one that has probably accelerated due to climate change). Passing the entrance channel for the North Sawyer Glacier en route to the South Sawyer Glacier, we couldn’t even see the glacier. 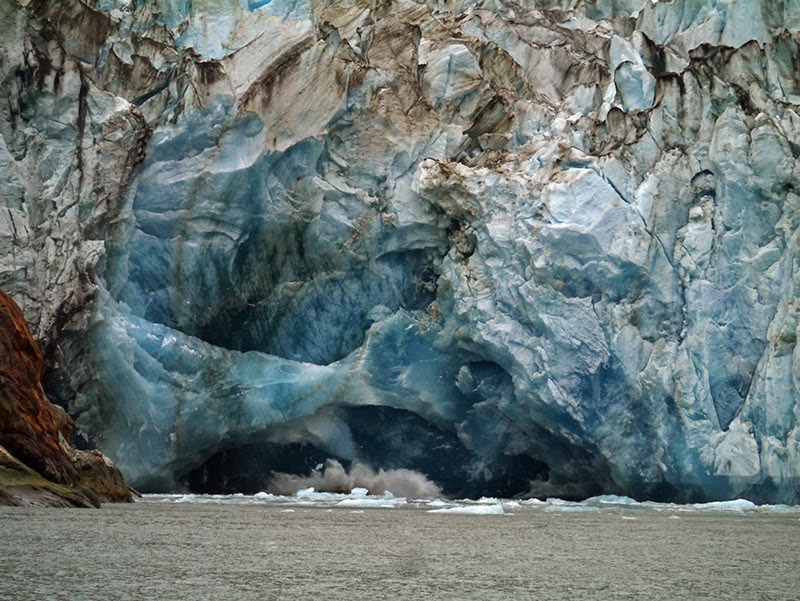 Patrick remarked that the last time he was there (2004), you could see the glacier from the main channel. 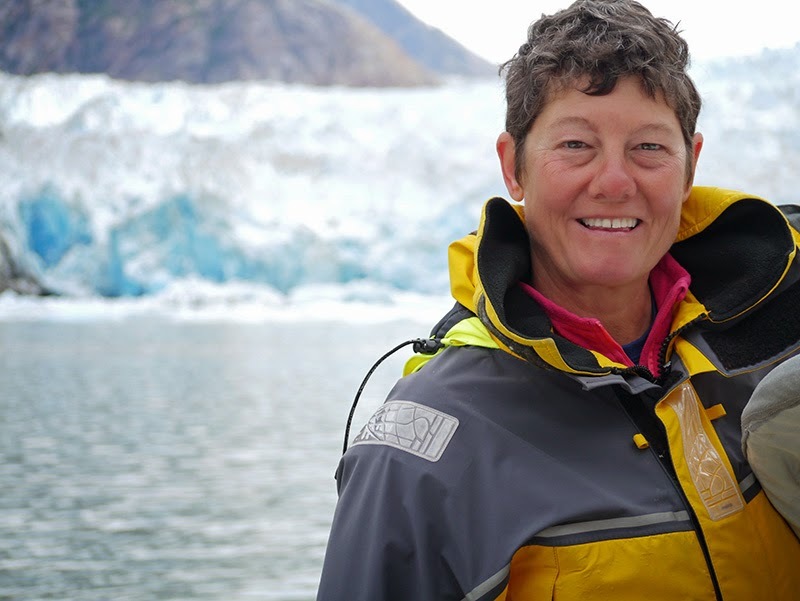 I had also snapped multiple photos of LaRose during the trip up Tracy Arm and in front of the glacier, which I promised to send to the boat’s owner when we got to Petersburg. 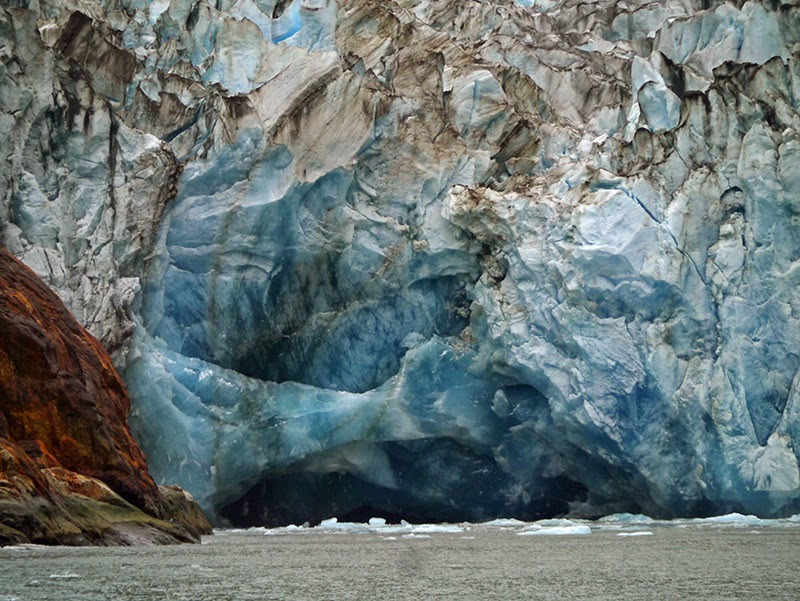 After seeing the South Sawyer Glacier, we returned to the entrance channel for the North Sawyer Glacier. 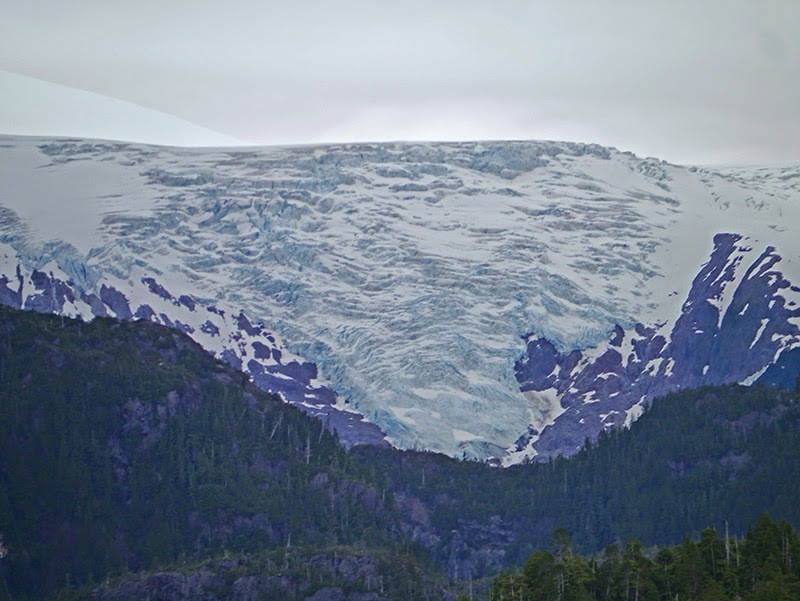 I was glad we didn’t pass it by, because once inside, we began to see our first views of the still-present glacier. 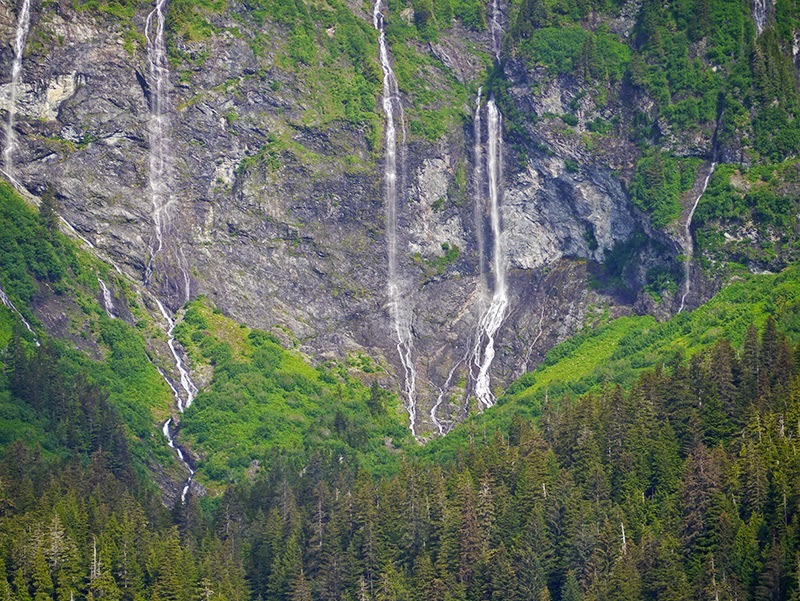 The channel was also alive with rivulets and waterfalls: trickling, singing, roaring. 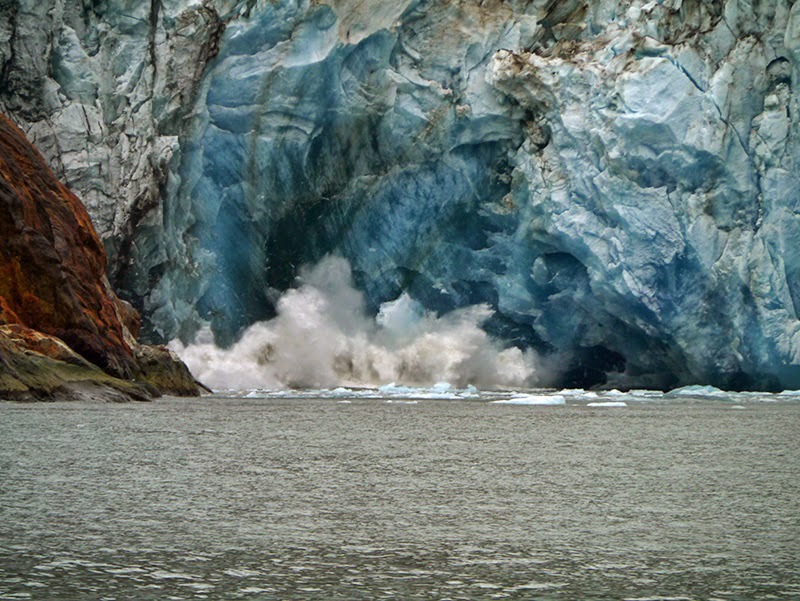 It was at the North Sawyer Glacier that we witnessed our most dramatic example of calving. An ice bridge over part of the glacier fell down while we were present! ....and calves into the sea...Kaboom! We lost the sun before we left the North Sawyer Glacier and made the return trip down the Arm under leaden, slate blue skies. 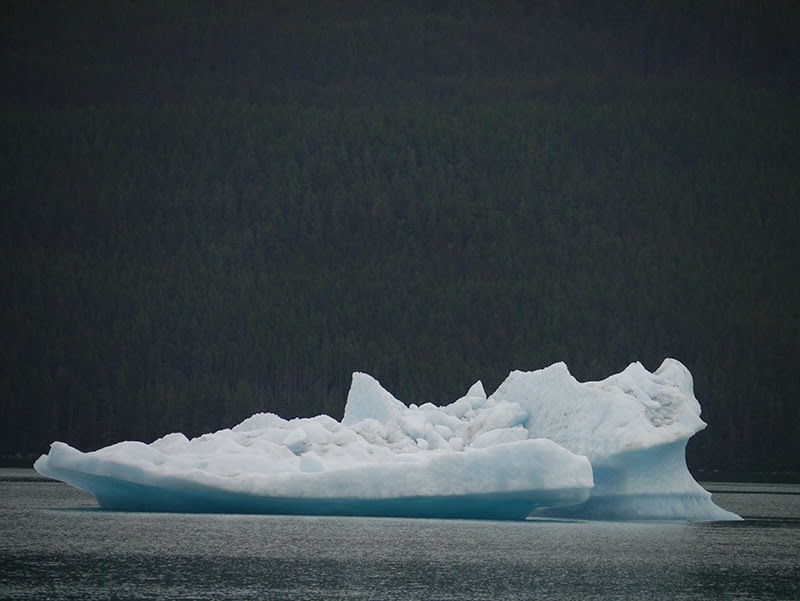 We set the hook in Tracy Arm Cove at 7:00 p.m.: It had been a twelve-hour day in the presence of ice, the great carver. 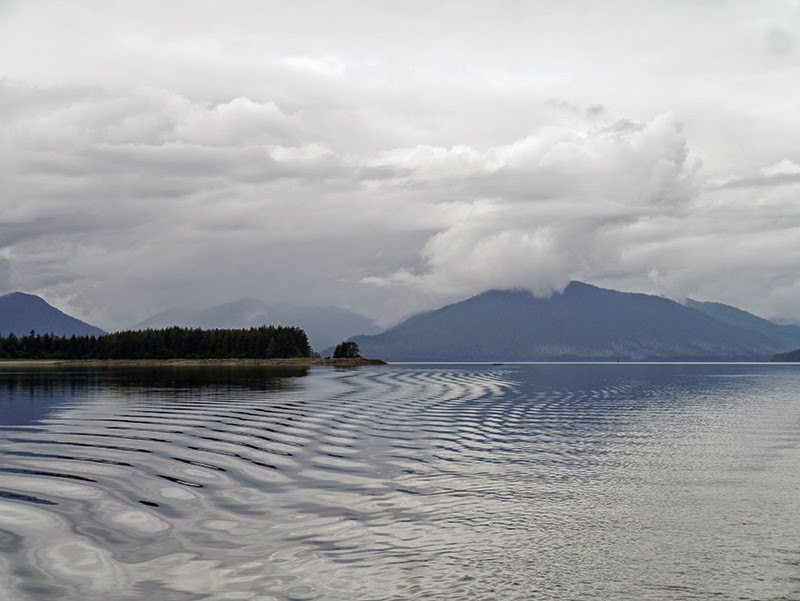 After leaving Sitka, we transited Sergius Narrows and the rest of Peril Strait to arrive on the east coast of Baranof Island on Chatham Strait. Southern Chatham Strait is, incongruously, more scenic and ice-covered than northern Chatham Strait, and we enjoyed the snowy peaks and hanging glaciers en route to Red Bluff Bay. 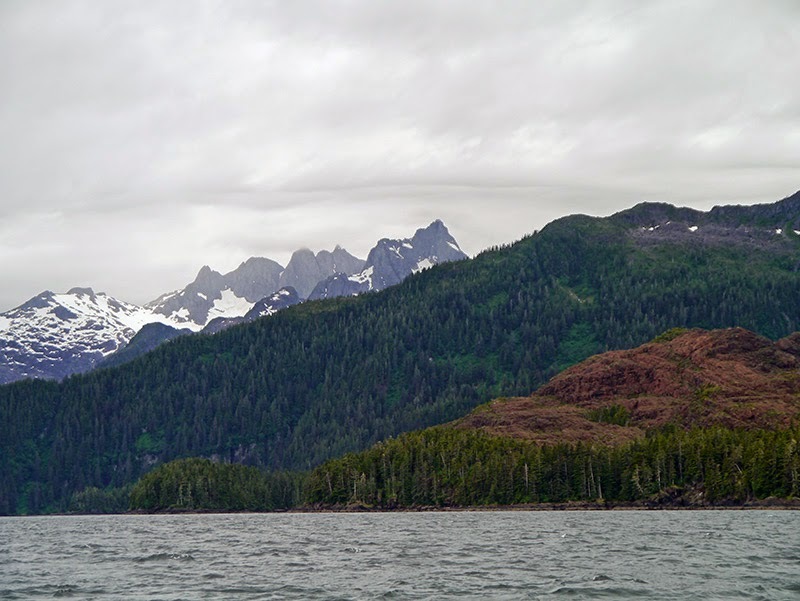 Patrick has already eloquently described our setting in Red Bluff Bay, easily our favorite spot on Baranof Island. To his description, I will only add a few pictures and some of my first impressions. 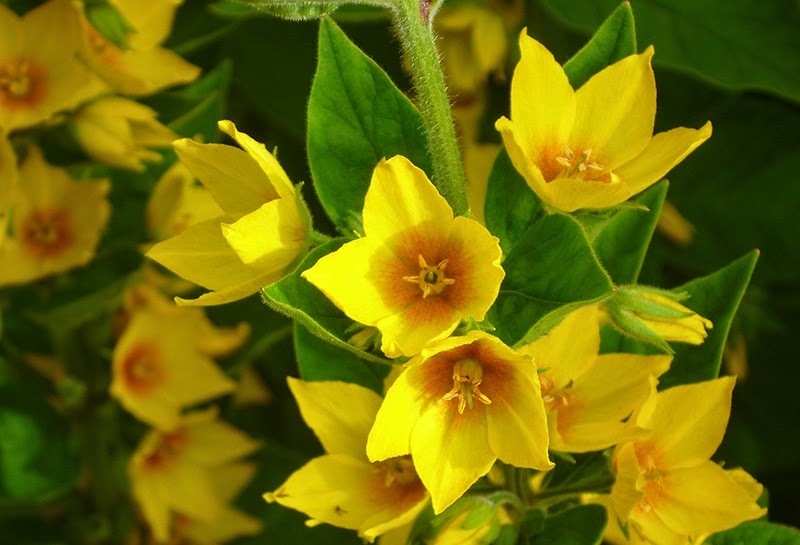 As we entered the narrow entrance to the bay, protected by a series of small islets, I was overwhelmed by the vanilla-scent of yellow cedar. Going back deeper and deeper into the bay was like going back into time primordial. For a few blessed days, we were permitted to live in the midst of wild animals. It is a privilege to live alongside wildlife and watch other creatures go about their daily business. To think that living in the midst of other animals was once our daily business: Now, we live with our pets---domesticated, wonderful companions---several degrees removed from the wild. Habitat degradation and destruction have become so prevalent, we really don’t know what it means anymore to live with wildlife. When you visit Alaska, you are reminded of how we used to live. 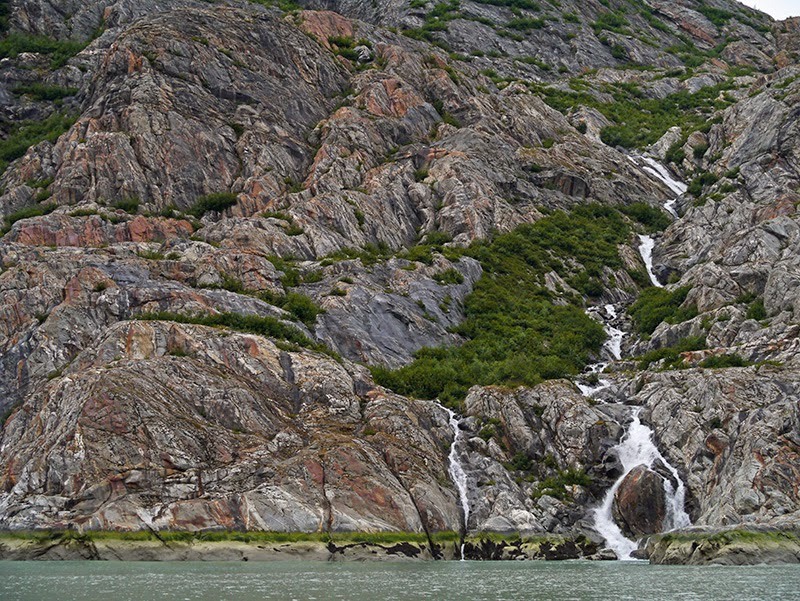 The only drawback to Red Bluff Bay was that even in a remote, spectacular anchorage such as that, small cruise ships and National Geographic Eco-Adventure ships did enter. 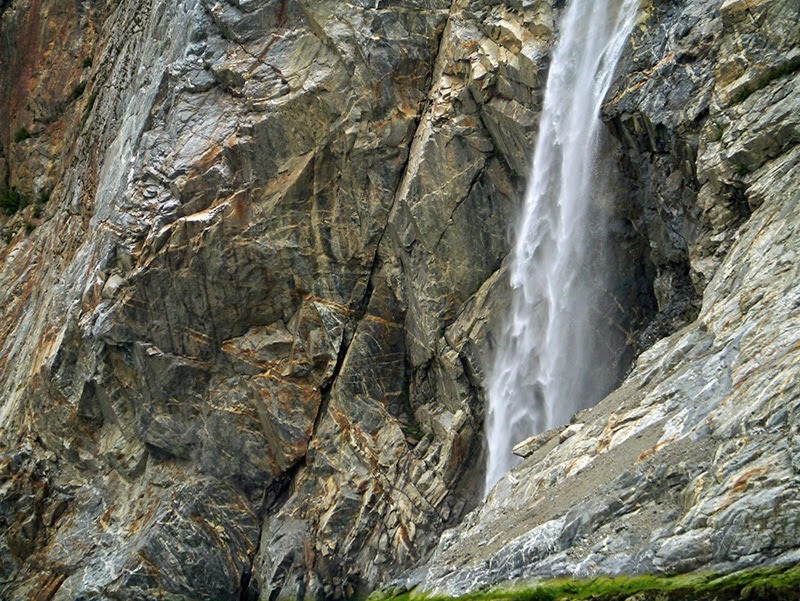 They didn’t anchor overnight, but they came in to show their clients the magnificient waterfall, sweeping down one of the granite faces like the grand staircase of a ballroom. They unloaded a flotilla of inflatables or an infantry of kayaks, just as the brown bears we had been patiently watching and waiting for all day came out in the bear meadow for an extended feeding period. In a whirlwind, they left again. After our visit to Red Bluff Bay, we began to work our way north again. 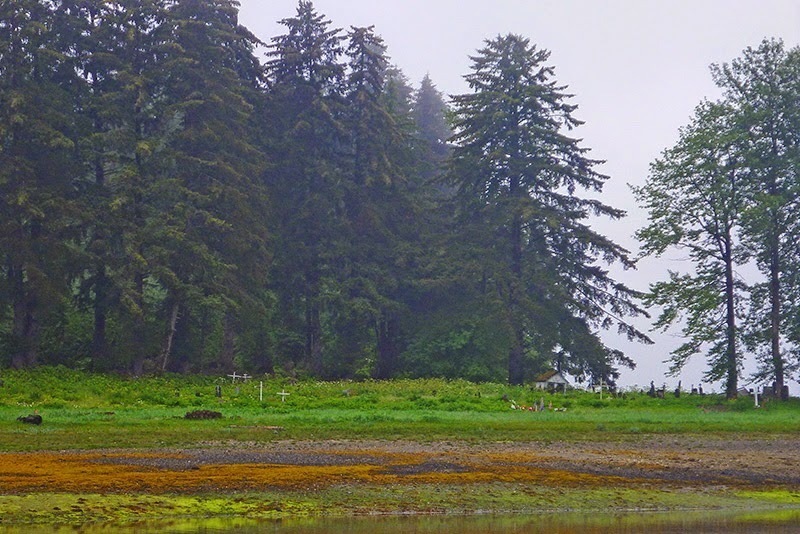 We stopped at Baranof Warm Springs Bay to visit the hot springs. 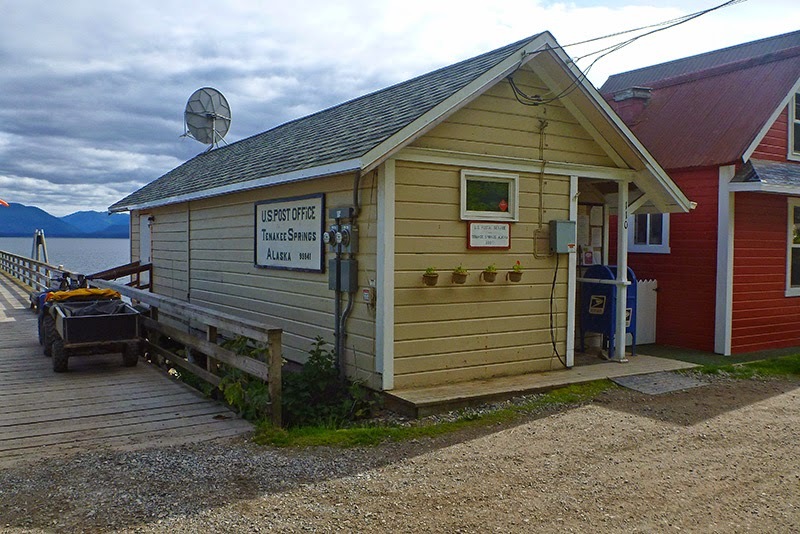 Although there is a community at Baranof, there are no facilities for cruisers (other than a public float and public baths) either at Baranof or at Baranof (fishing) Lodge. 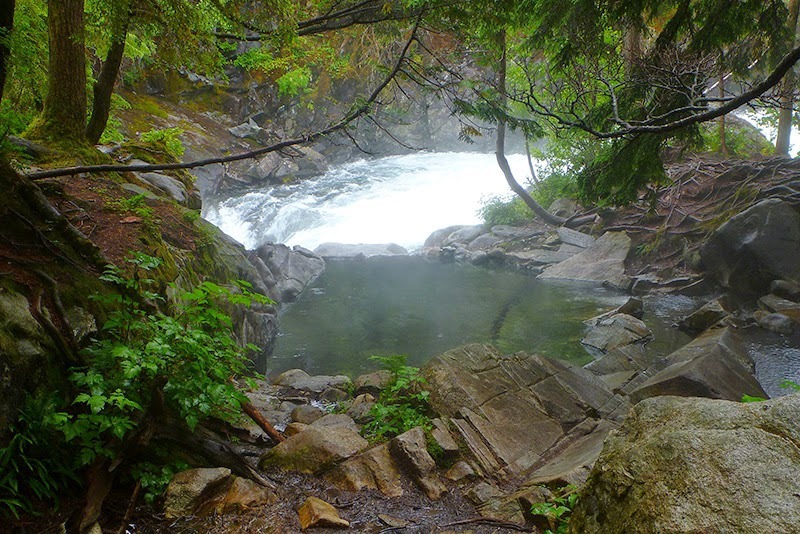 The hot springs are located in a scenic setting next to a waterfall, accessed by a boardwalk trail through somewhat swampy forest. 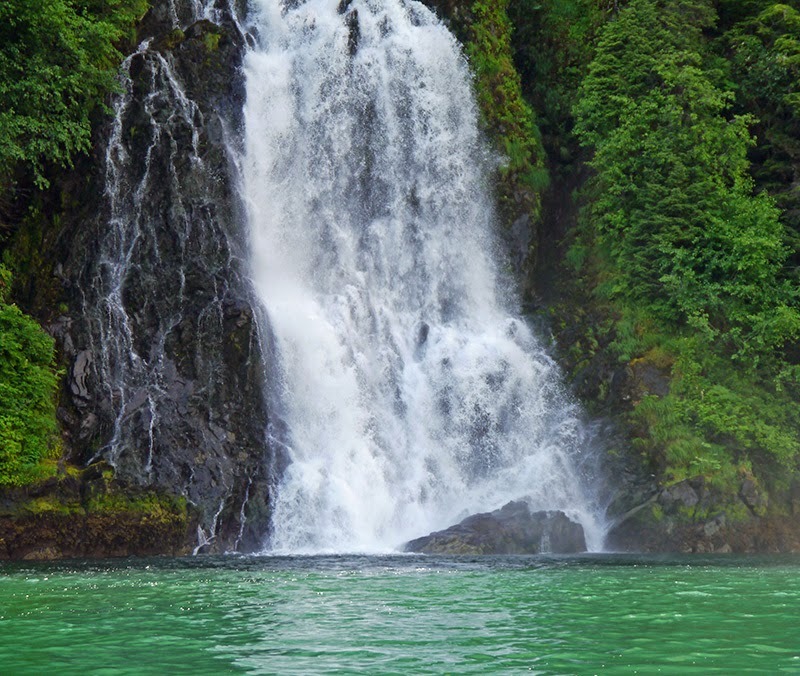 From the hot springs, you can continue on to Baranof Lake, home to cutthroat trout. 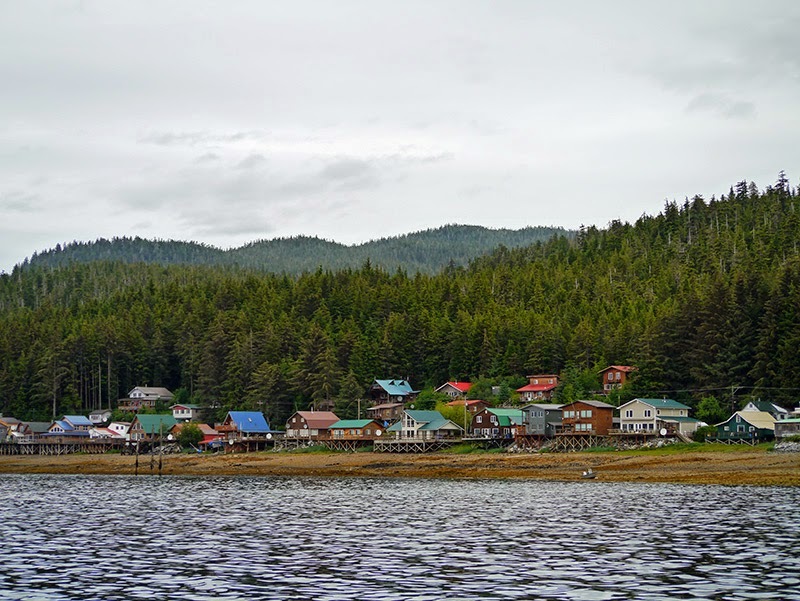 When I conjure up a term to describe some of the communities we visited in southeast Alaska, the term is “funky.” Tenakee Springs is quintessential funk. Although I’m told it is no longer a haven for old hippies and has turned into a retirement community, Tenakee Springs retains some of its former spirit. The main street is a gravel path through town on which the only vehicles are ATVs (All Terrain Vehicles, looking like golf carts). People drive around town on their ATVs as if they were part of an amusement park ride. The only reason ATVs are required at all is because the town is built along the waterfront; thus, the road and town are several miles long and not very deep. Landscaping is done with a splash of whimsy: a pink bicycle in a garden bed with a basket full of flowers, rainboot planters, decorative benches placed here and there along the walk through town that don’t seem to be public or private property. And the hot springs in Tenakee take the form of a public bath---where you bathe first and then soak---with separate hours for men and women. A mural from The Wind in the Willows decorates the outside wall of the bath house. 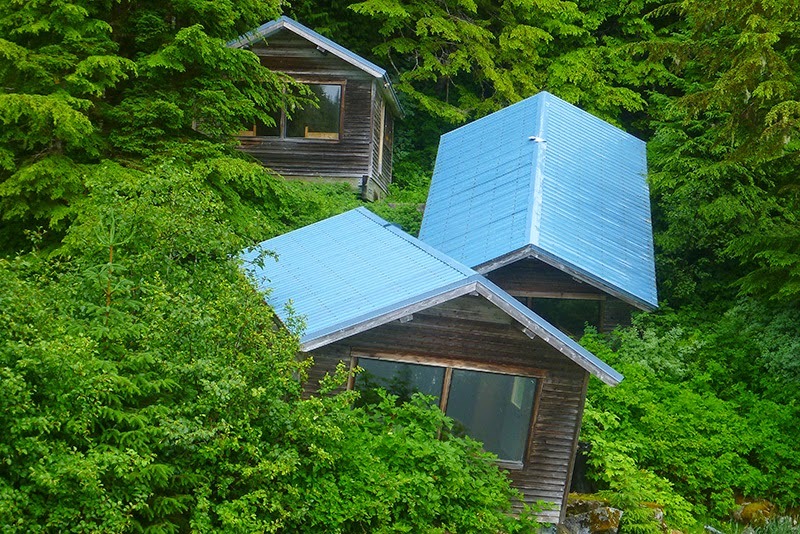 I regret that I never saw the inside, because I was at the drippiest stage of a cold when we arrived in Tenakee Springs. Tenakee Inlet is alive with salmon and I hooked two. 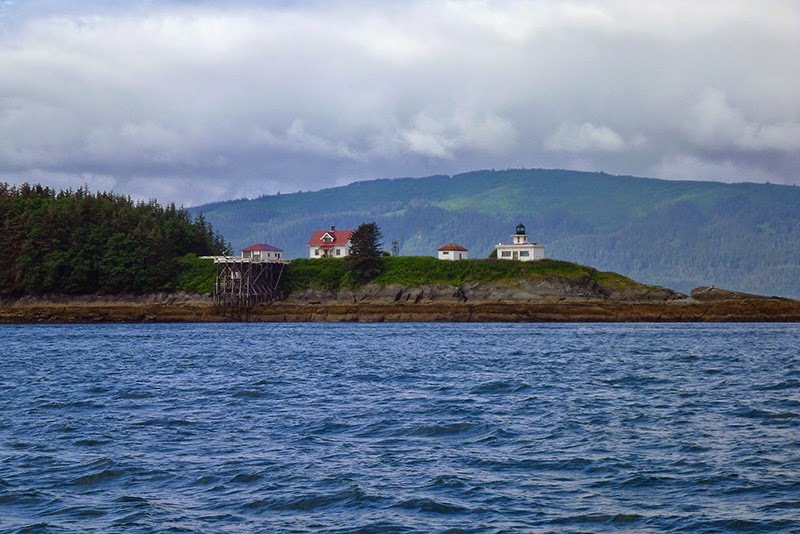 Our next stop was Hoonah, a Tlingit community on Chichagof Island that is surprisingly well appointed compared to the other communities we visited on the east coasts of Baranof and Chichagof. 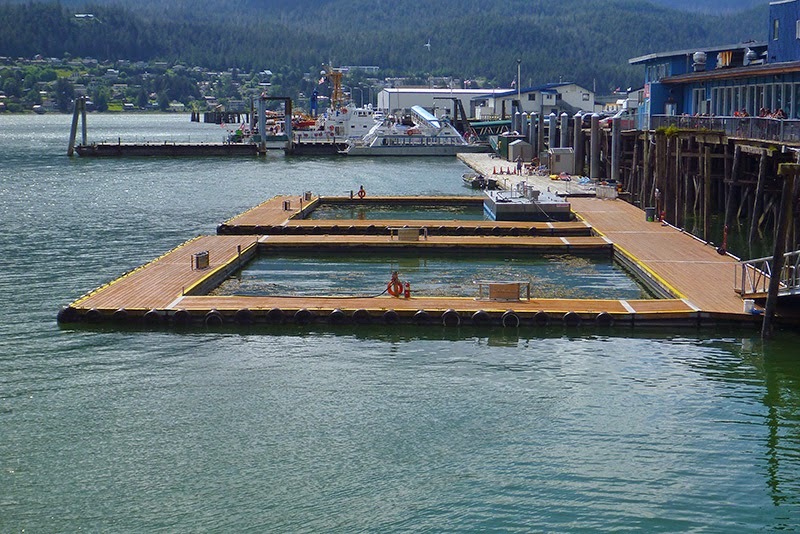 The harbor had both a Travel lift and a tidal grid, and the grocery store was the best stocked since Sitka. Unfortunately, we were there over a weekend, so we didn’t get a chance to visit the carving shed. 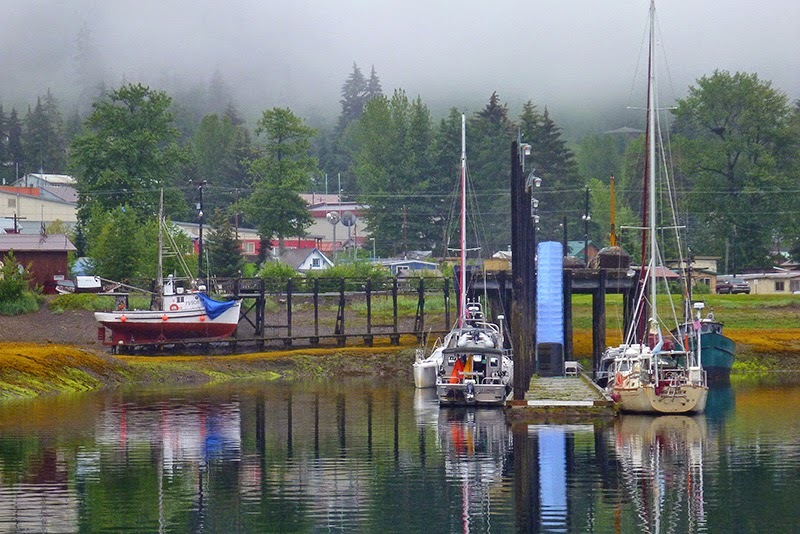 Cruise ships do go in and out of Hoonah, and they are thriving on the tourist trade. 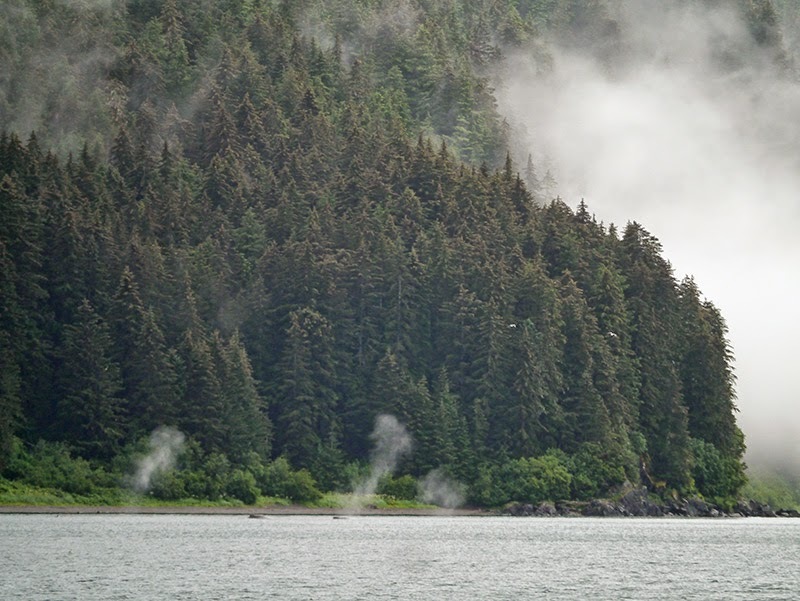 In Icy Strait, we whale-watched at Point Adolpholus (in the company of whale-watching tour boats) and visited Dundas Bay in mist and rain. 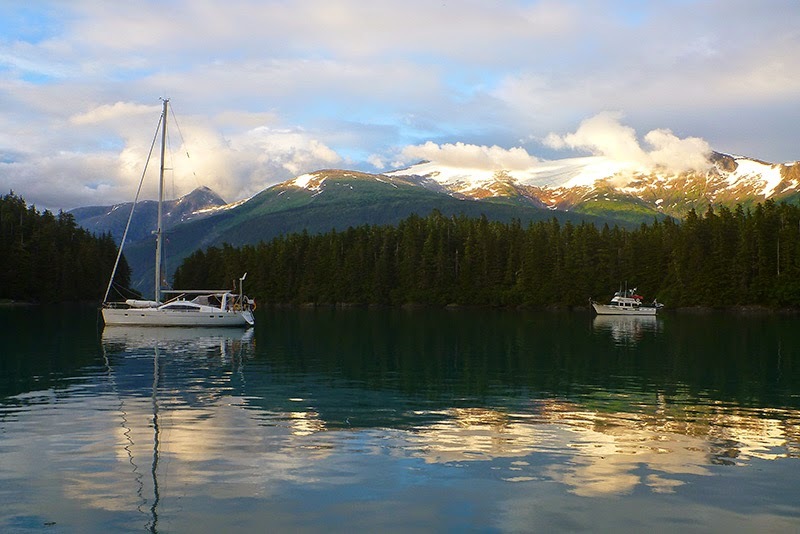 We did not visit the boardwalk communities of Elfin Cove and Pelican, nor did we visit Glacier Bay. We will have to visit them on a future trip. 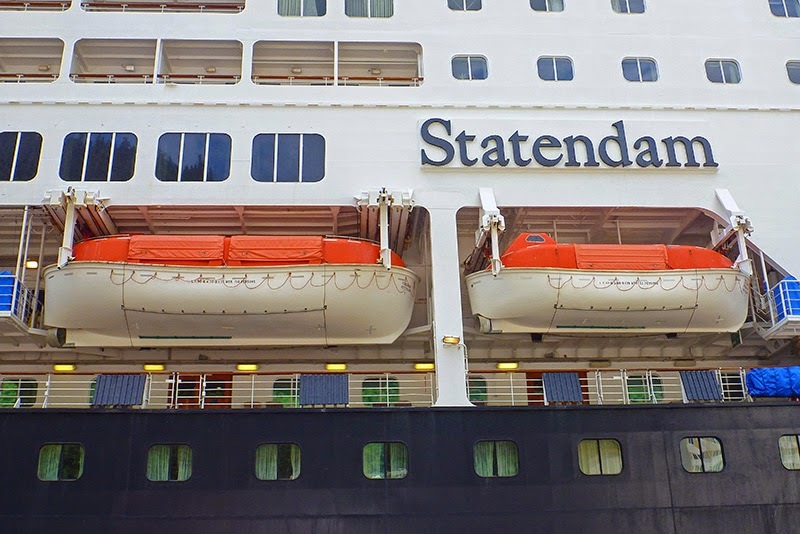 We realized that we were running short on cruising time, and that we were going to have to leave some destinations off our itinerary. The best way to save time was to cut out some transits up and back long inlets. 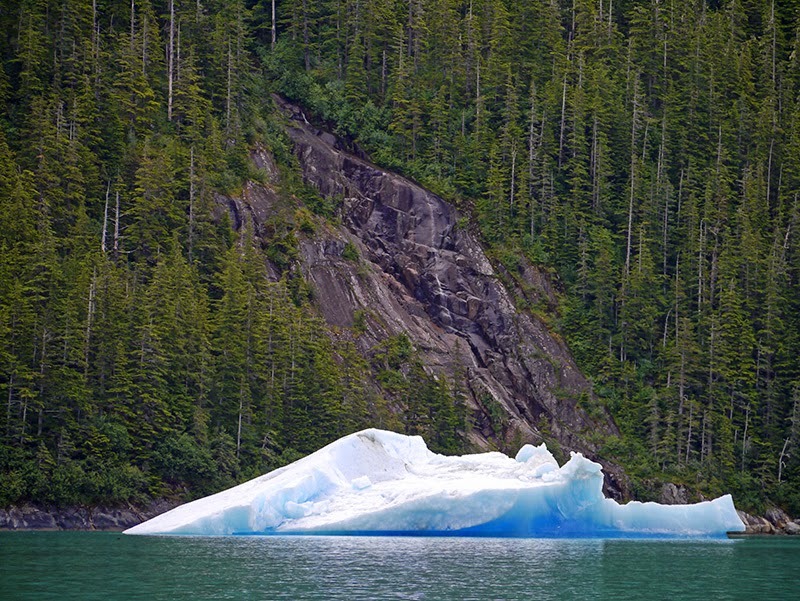 Along with Glacier Bay, Lynn Canal and Haines, as well as Endicott Arm, also hit the cutting room floor. We retained planned stops in Tracy Arm and Misty Fiords. In addition to running short on time, we were tiring of the cold, rainy, and foggy weather that had plagued us since our last day in Red Bluff Bay. We decided to cut our losses and head south for better weather. 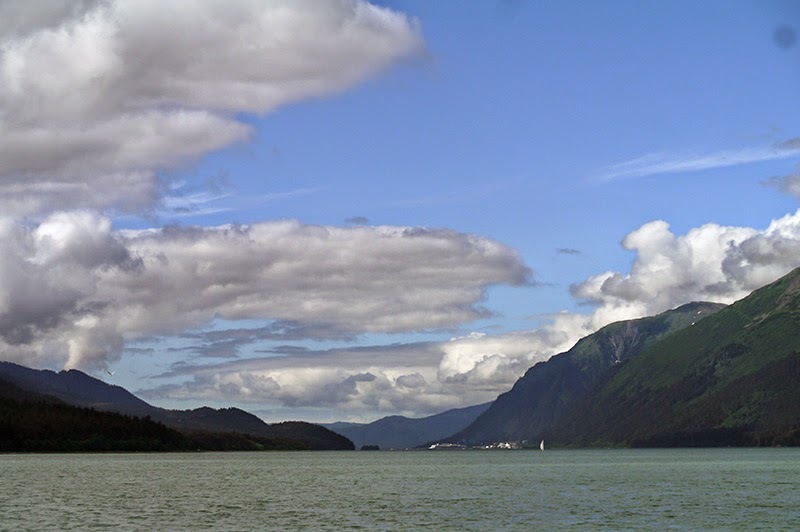 We headed for Juneau to begin our trip down the Inside Passage in earnest.